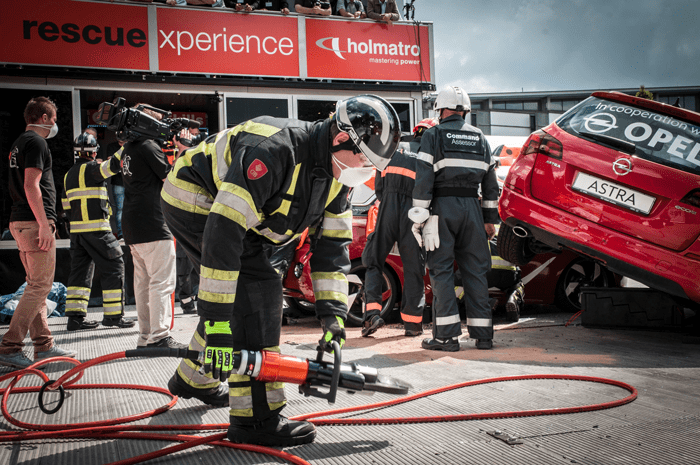 Between the 8th and 13th June 2015 we held a special Rescue Experience edition in Germany: The Holmatro Extrication Challenge. 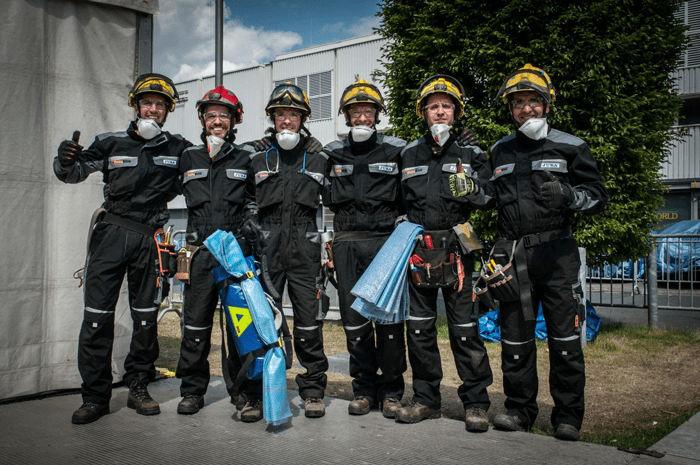 We were privileged to welcome 29 teams from 16 countries at Interschutz, all of whom tested their skills in vehicle extrication in front of a crowd of hundreds at the event itself and thousands who watched our live stream on the internet around the world. All teams were assessed in three areas: Incident command, Technical tool operation and Medical care. Each team was given 20 minutes to extricate a live ‘patient’ from a simulated road traffic collision. The four assessors (who came from Germany, South Africa, Australia and the Republic of Ireland) debriefed each team following their challenge and provided positive and learning points. We were fortunate that, due to our strategic partnerships with Opel and Renault, new vehicles were used in the pits. This offered an additional challenge to the teams due to the presence of new car construction and technology. Whilst this was not our first Rescue Experience it was the first time we had hosted an actual extrication challenge. Such events require a large degree of planning and my past roll as an assessor for United Kingdom Rescue Organisation (UKRO) and the World Rescue Organisation (WRO) gave me an understanding of the logistics involved. The planning started in October 2014 when we assembled our project team who would be responsible for overseeing the whole event and working with our external partners. Provide a safe environment for learning and sharing knowledge. 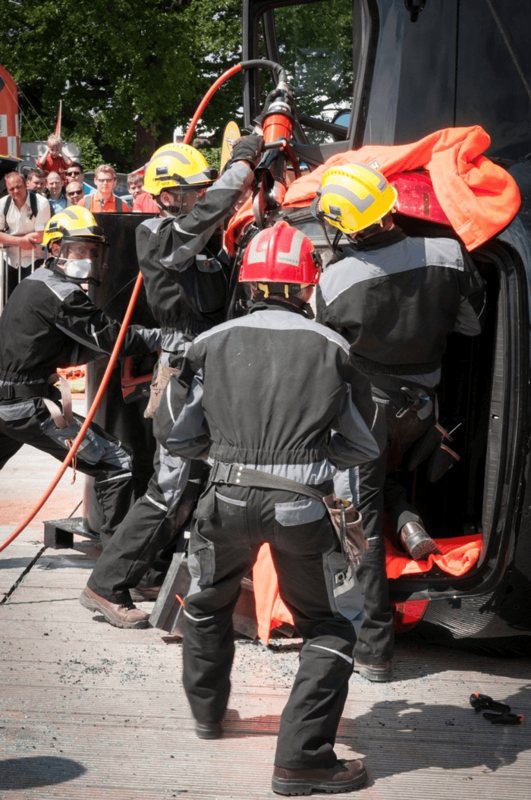 Provide realistic rescue scenarios that would stimulate and challenge the extrication teams. Provide a quality and honest appraisal of their performance with the emphasis on professional development. Provide an additional learning element by providing information on new vehicle technology from an external partner in the automotive industry. Attract teams who had never competed before and give them the challenge ‘bug’. Provide a VIP Experience for the teams. Facilitate teams development by signposting them to similar challenges worldwide. 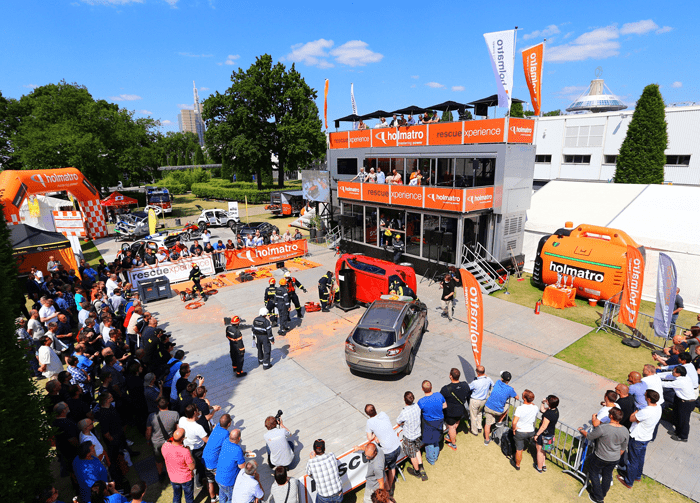 The livestream on our event website http://live.holmatro.com accompanied with live commentary proved extremely popular with over 20,000 live stream views (over 222,000 minutes) and at the time of writing 18,000 on demand (YouTube) views. The on demand views provide an excellent on line training resource and the number of views continues to grow daily (check our Holmatro YouTube channel for details). Interviews with team members were also a very popular part of the event as this gave the competitors a chance to share their views on how their challenge went. Based on the feedback of the teams, all of our aims were met. Everyone who took part has given us very positive comments about the learning experience we created and the challenge they faced. Approximately 70% of the teams had never taken part in a rescue challenge. All said they would compete again. The overwhelming feedback from those who had taken part in a challenge before was that our event had really set a standard in terms of creating a team experience. The team members told us that from the moment they registered online they felt part of the event. Even teams who (by their own admission) perhaps did not perform as well as they would have hoped, all said they really enjoyed the challenge and it had given them areas on which to focus and improve. Despite this being a challenge and not a competition there was inevitably a winning team. Meath County Fire & Rescue Service from the Republic of Ireland took the first prize and were crowned champions of The Inaugural Holmatro Extrication Challenge 2015. 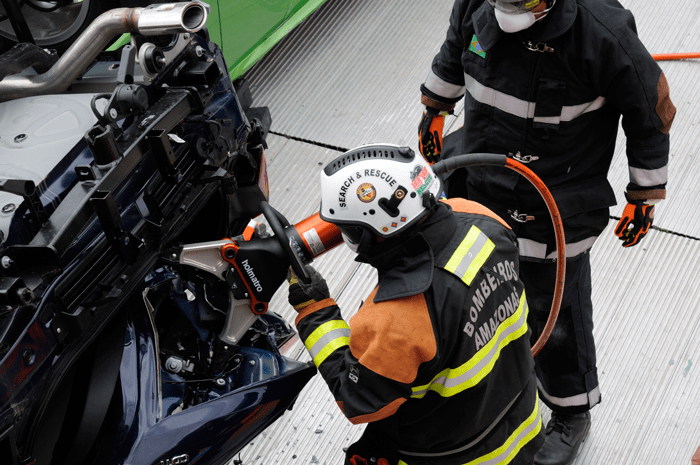 In addition to the honour, they also won a Holmatro Extrication Tools set worth €20,000. The Best Technical Team went to Bombers Generalitat Granollers from Spain and they took away €10,000 of Holmatro Extrication Tools. Something a little different for our event was the Best Team Spirit Award. The team who won this had never competed before, were very young, had only trained as a team on three occasions and during their isolation (period before competing) they nearly left due to nerves. They showed true spirit by performing very well and finishing in the top half out of 29 teams. Not only did they perform well but they now want to compete again. The award deservedly went to the German Rescue Ladies. 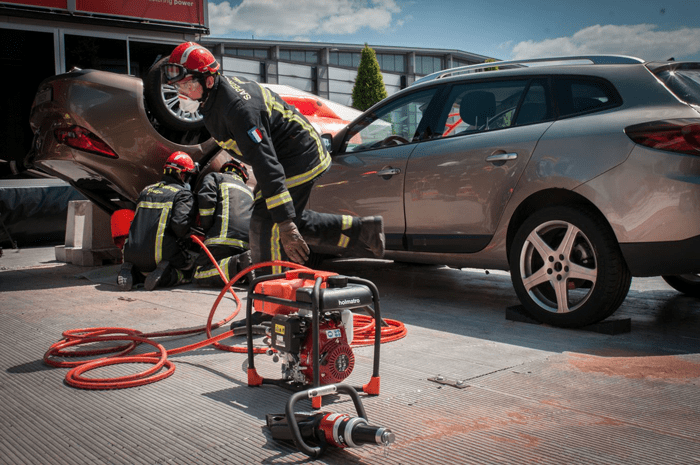 They also took home €5,000 of Holmatro Extrication Tools. 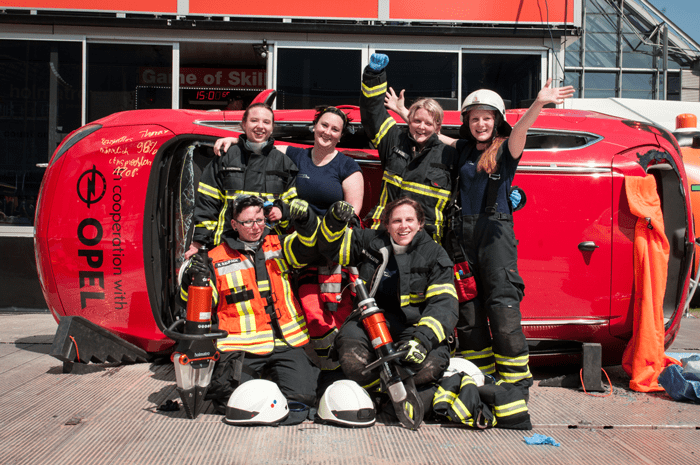 This women’s only extrication team really demonstrated true spirit. In addition to the awards above, South Yorkshire Fire and Rescue Team were awarded ‘Best Medic’ and Meath County, as well as taking the first prize also had the ‘Best Incident Commander’ in their team. In summary the event for us as hosts, was extremely satisfying. The spirit, determination, professionalism and great humour of all the teams who took part made a long exhibition week very enjoyable. The atmosphere was fantastic and although teams wanted to do as well as they could, they were all there to ultimately learn and improve their skills and knowledge. The true beneficiaries of such challenges are in the end the communities that are served by these fantastic rescue teams. This is the first time (to my knowledge) that a tool manufacturer has hosted an extrication challenge. Based solely on the feedback from the competing teams, our inaugural challenge was a 100% success. So, until the next time!